Is Finish Line Inc (FINL) Going to Burn These Hedge Funds? Finish Line Inc (NASDAQ:FINL) was in 21 hedge funds’ portfolios at the end of September. 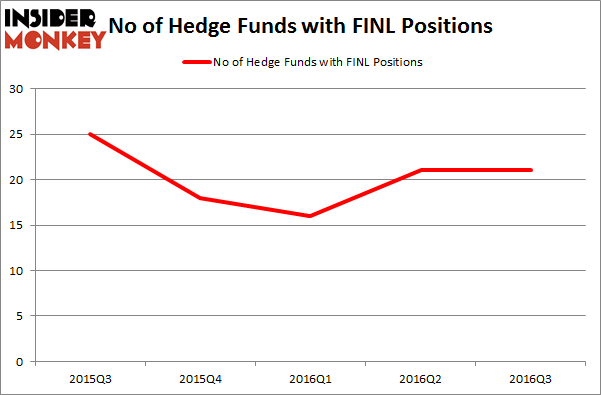 Hedge fund interest in FINL shares was flat at the end of last quarter. This is usually a negative indicator. At the end of this article we will also compare FINL to other stocks including Chesapeake Utilities Corporation (NYSE:CPK), ScanSource, Inc. (NASDAQ:SCSC), and Brooks Automation, Inc. (USA) (NASDAQ:BRKS) to get a better sense of its popularity. What does the smart money think about Finish Line Inc (NASDAQ:FINL)? Heading into the fourth quarter of 2016, a total of 21 of the hedge funds tracked by Insider Monkey held long positions in this stock, unchanged from one quarter earlier. By comparison, 18 hedge funds held shares or bullish call options in FINL heading into this year. With hedgies’ capital changing hands, there exists an “upper tier” of noteworthy hedge fund managers who were increasing their stakes considerably (or already accumulated large positions). According to Insider Monkey’s hedge fund database, Point72 Asset Management, led by Steve Cohen, holds the biggest position in Finish Line Inc (NASDAQ:FINL). Point72 Asset Management has a $5.8 million position in the stock. Coming in second is Arrowstreet Capital, led by Peter Rathjens, Bruce Clarke and John Campbell, holding a $3 million position. Other members of the smart money that are bullish comprise Ken Grossman and Glen Schneider’s SG Capital Management, Neil Chriss’ Hutchin Hill Capital and Joel Greenblatt’s Gotham Asset Management. We should note that SG Capital Management is among our list of the 100 best performing hedge funds which is based on the performance of their 13F long positions in non-microcap stocks. Is Northstar Realty Europe Corp (NRE) Going to Burn These Hedge Funds? Is Nordic American Tanker Ltd (NAT) A Good Stock to Buy? Hedge Funds Don’t Think Very Highly of Annaly Capital Management, Inc... Hedge Funds Are Still Buying Novanta Inc (USA) (NOVT) Should You Avoid Nationstar Mortgage Holdings Inc (NSM)? Is Liberty Sirius XM Group (LSXMK) A Good Stock To Buy?